Each morning I start the day with great tasting coffee made by my trusty Brookstone single cup coffeemaker. I like millions of others around the world, am not a morning person so I need a good kick before I can become productive. After buying this machine my morning rush has been a breeze to handle. Even on days that I am running late, I will not have to worry about wasting more time to make coffee. Here are some of the benefits I love most about the Brookstone single cup coffeemaker. I was looking for a reasonably priced machine that was simple to operate and could make delicious coffee fast. After browsing and comparing countless other coffeemakers, I was most interested in the Brookstone single cup coffeemaker. It was attractive with a stainless steel body and sleek design. The operations seemed pretty cut and dry so it was perfect for someone like me who doesn’t have much time in the mornings. I was impressed with how fast it works and even after using it for a couple months now, the parts are still going strong. Another reason I chose the Brookstone single cup coffeemaker over others is because I can either use the included travel mug, which is well-made and sturdy, or I can use my own mug as well. On certain days where I need more to wake me up, I can simply use more water and a larger mug. Mostly, I just use the travel mug that is included simply because the double steel keeps it warm while I’m getting ready for work. One more small but important detail and reason why I chose the Brookstone single cup coffeemaker is because of the smart placement of the power cord. Instead of being in the back like countless other models are, it is located on the side so I can push it all the way back to my counter without squishing the cord. I can see other coffee drinkers appreciating this tiny but accommodating benefit because it makes finding a spot for the machine much easier. My favorite benefit of the Brookstone single cup coffeemaker is that it combines form and function. I only have to wait 2 minutes and the coffee tastes as good as the kind brewed by professionals. I have extremely high standards of quality and was impressed with how tasty the results were and how little time I needed to wait. Convenience is also a major factor whenever I buy household appliances and this machine passed my vigorous test. The Brookstone single cup coffeemaker is designed to accommodate the busy lives of many coffee drinkers so convenience is a major deal. Aside from making great coffee within minutes, there is also an automatic shutoff feature to save time and money, while protecting your home. Especially for individuals like me who often leave the house without remembering to turn off the machine, the Brookstone single cup coffeemaker will take care of itself. For a more than reasonable price online, you can enjoy deliciously fresh coffee each morning in just 2 minutes. 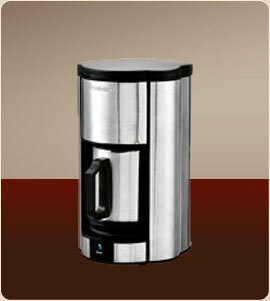 I am pleased with this machine because of the convenience great taste it offers as well as the sophisticated design. If you are looking to make your busy or miserable mornings more efficient and pleasant then the Brookstone single cup coffeemaker could be perfect for you. I’ve had this coffee maker for about 5 months and it works great. This is an excellent deal for the price (I got mine for $35 online).